Self assembly of knocked down power stand required, and machine head installation is required on this model. See 206RB with assembled power stand at the bottom of this page. Specify closest warehouse: New Jersey, Jacksonville, Florida, St.Louis, Mo. or Fullerton, Ca. Also available for your pick up at those locations to save all shipping costs. Add Optional S32 Welting, Piping, Cording Foot Set under Recommended Accessories below. Warning: No instructions are available for putting the stand together, so if you have never assembled one or do not have another one to go by, buy the assembled version below. Consew 206RB Sewing A French Seam for Upholstery. I am showing how to do a French Seam with a single needle machine. Double needle machines make it a lot easier, but you can do quite a good job with a single needle. This is a large bobbin Walking Foot machine. Designed for stitching such products as auto, boat and furniture upholstery, tarpaulins, covers, sails, tents, camping trailer covers, awnings, umbrellas, tops, bags, luggage, handbags, travel ware accessories, sports and camping equipment, wearing apparel, outdoor clothing, canvas shoes, slippers, orthopedic appliances etc. 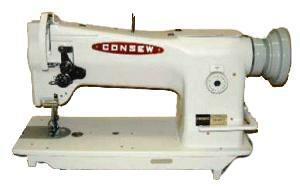 Included with each new machine is a genuine Consew accessory kit. and factory operating instruction and part books. Size Please Choose 1/8" 5/32" 3/16" 1/4" 5/16" 3/8" 1/2" 5/8" 3/4"
Size Please Choose 1/8" 3/16" 1/4" 5/16" 3/8"